Higher National Diplomas (HND) and Higher National Certificates (HNC) are vocational courses – this means that they focus on preparing you for a specific job or career. 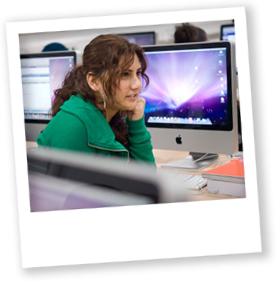 Some of the most popular HND courses are in business studies and computer science. Other popular areas of study are tourism, sport and hospitality. HNCs are BTEC level 4 qualifications, and HNDs are BTEC level 5 qualifications. Check out our what are BTECs page to find out how they fit into the BTEC framework. Most students take them after they have finished studying for a level three qualification such as a at college or sixth form. Studying full time a HND takes two years, and a HNC takes one year. Usually this would be doubled if you study part time - so a HND would take four years, and a HNC two years. Because HNDs and HNCs are designed to prepare you for a career, when you have finished you will be in an ideal position to move straight into a job. 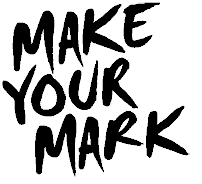 Another option is to ‘top up’ your qualification, this often means spending an extra year or two in education to gain an undergraduate degree. 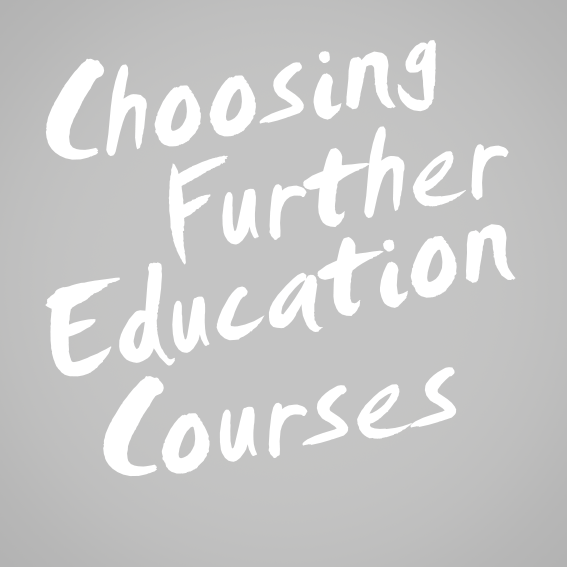 HNDs and HNCs are taught in further education colleges and universities all over the country. You can also study some HNDs and HNCs as distance learning courses. What do I need to get to study them? Most HNDs and HNCs require that you have completed a level three qualification, like an A-Level or BTEC. Some will also require you to attend an interview or maths and literacy tests. Because entry requirements can be different depending on the course it is important to check the entry requirements for the specific course you are interested. The qualifications grid shows some of the most common qualifications in the UK, and their levels. There are 8 levels of study in the UK, remember these don't relate to how long qualifications take, but they are used to show how qualifications compare with each other. 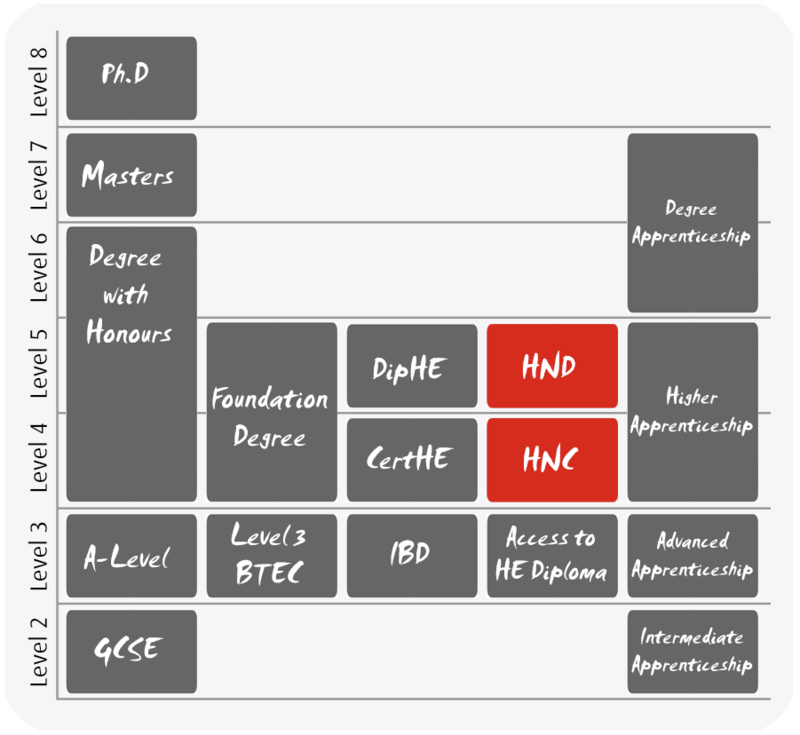 Use the grid to find out what level HNDs and HNCs are in comparison with other qualifications. You apply directly to colleges and universities for HND and HNC courses, so it is best to check out individual websites for the most up to date information. 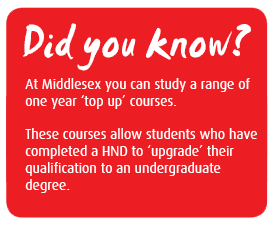 However, whatuni has a really helpful tool that might help you find HND and HNC courses. Make sure you filter by course type. Prospects.ac.uk has some useful statistics around what jobs people who have studied for HNDs and HNCs have gone onto, and the subject areas they studied. 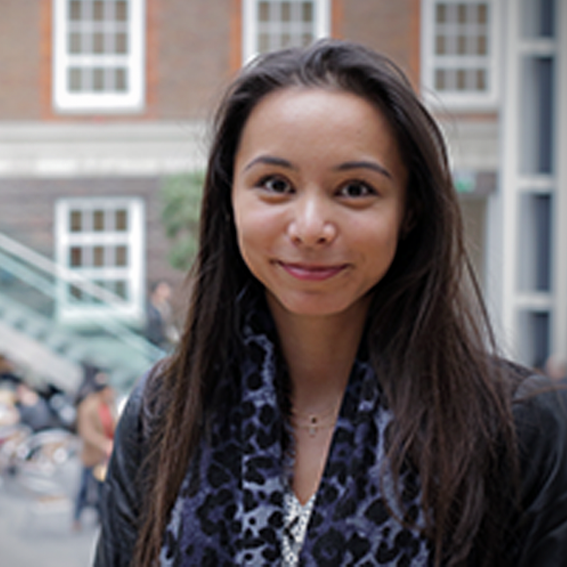 Read more on the Pearson website, which lists all available HND and HNC subjects.